Pelles C is a freely available integrated development environment (IDE) that includes an assembler, C compiler, linker, editor, debugger and many project management utilities. This article demonstrates how Pelles C 7.00 can be used to develop applications for WinCE. Connect your Toradex Module with the development PC. If you use Windows XP or an earlier version you need to install ActiveSync. 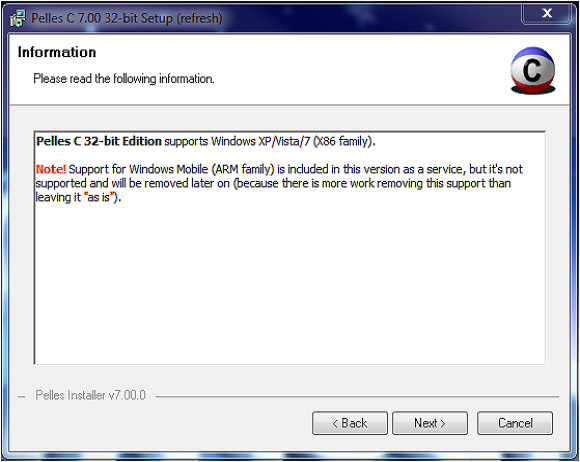 Windows 7/8 will automatically use Windows Mobile Device Center. Go to Pelles C download section to download "Setup, 32-bit edition" (version 7.00) or click here for the direct link. Ignore this warning and click on Next. 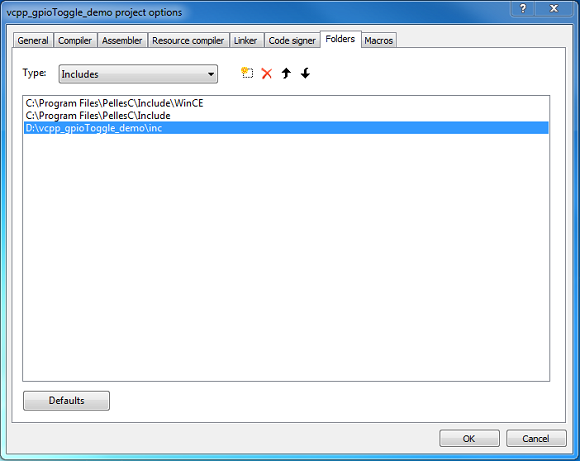 In Choose Components window, Select the type of install as Full and click on Next and Install. Download Toradex template project wizard from here. Extract it and place the extracted dll in Program Files > PellesC > Bin > Wizards on your development PC. 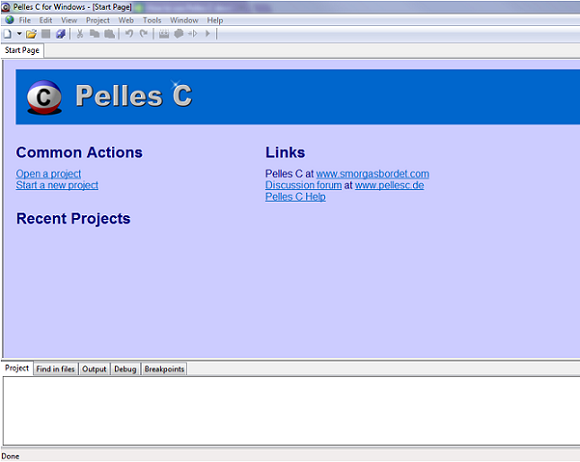 Run Pelles C IDE from the Windows Start menu. 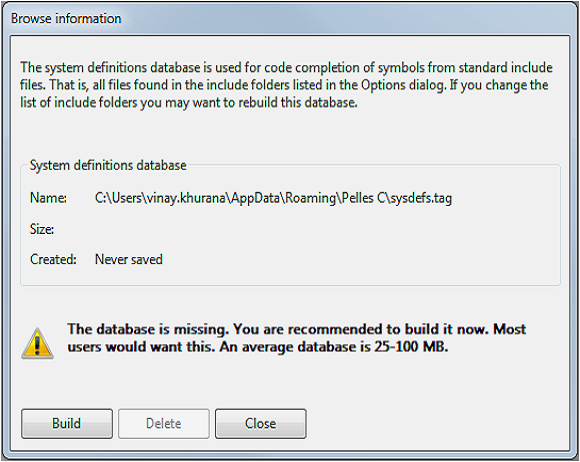 Click on Build to build the database. After the database is created, click on Close to go to main window. 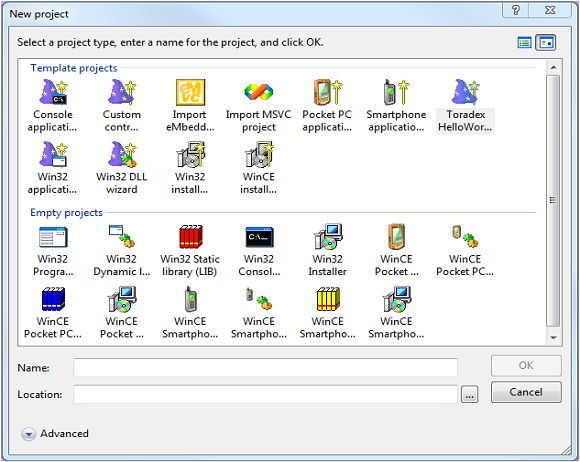 Select Toradex HelloWorld (EXE) template project in New project window, name the project vcpp_helloWorld_demo and click on OK.
Win32 application wizard window will open. 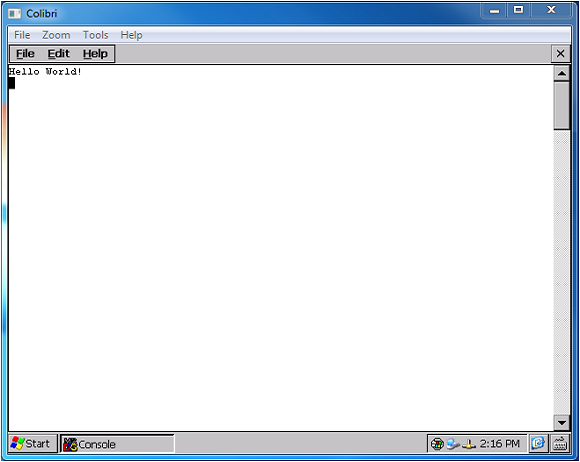 Select 'A "Hello, world" program' and click on Next and Finish. The source code will be automatically generated. Go to Project and click on Build helloWorld_demo.exe to build and Execute helloWorld_demo.exe to run the application. Go to Tools > Capture Screen from Pocket PC File > New bitmap to get the target screen image remotely or you can use Remote Display tool also. This demo shows the use of Toradex GPIO library to toggle the SODIMM pin number 133. Download the free GPIO library from here. 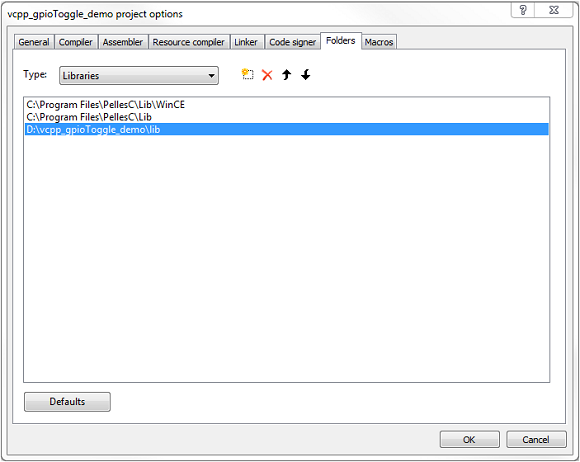 Create a new project following the above steps and name it vcpp_gpioToggle_demo. Copy the header file GpioLib.h from inc folder in downloaded files and paste it to the vcpp_gpioToggle_demo > inc directory. Go to downloaded files and copy GpioLib.dll from libs > dll > ARMV4IDbg and paste it to the vcpp_gpioToggle_demo > lib directory. Copy the polib.exe file from Program Files > PellesC > Bin and paste into vcpp_gpioToggle_demo > lib folder. polib.exe converts dll file to lib file used by Pelles C compiler. Use following command in command prompt to generate lib file. This will generate a lib file with name GpioLib.lib under d:\vcpp_gpioToggle_demo > lib directory. Copy and paste the following code in main.c. int WINAPI WinMain(HINSTANCE hInstance,      ///< Handle to current instance. HINSTANCE hPrevInstance,  ///< Handle to previous instance. LPWSTR lpCmdLine,         ///< Pointer to command line. int nCmdShow)             ///< Show state of window. InitGPIOLib();                      ///< Initializes GPIO library. SetPinAltFn(133, -1, DIR_OUT);      ///< Sets SODIMM Pin 133 as GPIO(-1) and set to Output. SetPinLevel(133, FALSE);        ///< Sets the logic level of SODIMM pin 133 to LOW. SetPinLevel(133, TRUE);         ///< Sets the logic level of SODIMM pin 133 to HIGH. 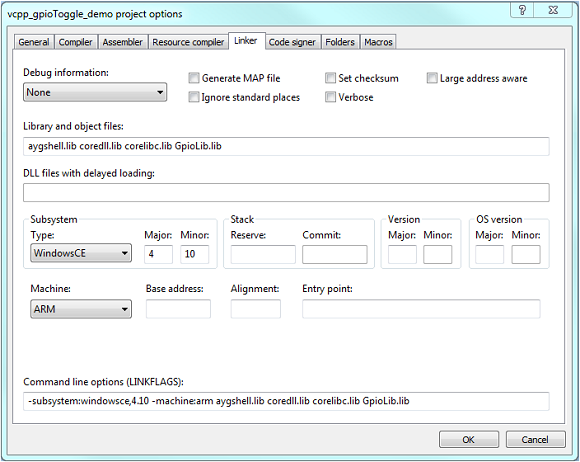 DeInitGPIOLib();     ///< Releases resources used by GPIO library and de-initializes GPIO library. Copy GpioLib.dll from vcpp_gpioToggle_demo > lib and paste it to FlashDisk > System on your WinCE device. Go to Project and Build and Execute the application. You can download this demo project from here.